Hazel Gearhart, 92, of Edon, Ohio, passed away at 8:20 P.M. on Monday, August 18, 2014, in the Community Health Professionals Inpatient Hospice near Defiance, Ohio. She had resided in The Village at Hillside Country Living near Bryan, Ohio, and had been a lifelong resident of Edon. 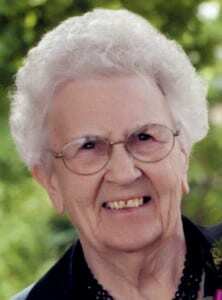 She was a 1940 graduate of Edon High School and was a member of St. Peter’s Lutheran Church in Edon. Hazel Gearhart was born on October 17, 1921, in Florence Township, Edon, the daughter of Leroy and Elizabeth (Kirby) Doty. She married Ellsworth Gearhart in Edon on January 8, 1941, and he preceded her in death on December 10, 1994. Survivors include her children, Marvin (Kay) Gearhart and Darlene (George) Burkhardt, both of Edon, Steven (Deanna) Gearhart, of Goose Creek, South Carolina, Kathleen (Lanny) Meroney, of Ligonier, Indiana, and Luanne (John Sanford) Gearhart, of Cheyenne, Wyoming; eleven grandchildren, Susan Held, Sandra Briner, Kelli Burkhardt, Kris Burkhardt, Terri Sedam, Eric Gearhart, Steven Gearhart, Amy Meroney, Michael Meroney, Andrea Sponsel and Alexandria Sanford; eighteen great-grandchildren; and five great-great-grandchildren. Also preceding her in death were her parents, three sisters, Eileen Hall, Lois Ludwick and Evelyn Doty, and one brother, Robert Doty. Memorials may be made to Community Health Professionals Inpatient Hospice, 6526 State Route 66 North, Defiance, Ohio 43512, Hillside Country Living, c/o The Village, Bryan, Ohio 43506, or St. Peter’s Lutheran Church Memorial Foundation. Be the first to comment on "Hazel Gearhart (1921 – 2014)"